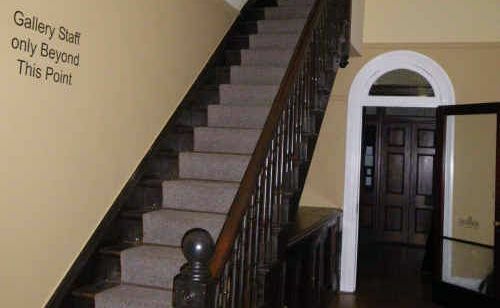 The staircase at the Grafton Regional Gallery became a focal point of Saturday night’s paranormal investigation. I'M STANDING in the middle of the old Grafton cemetery near Corcoran Park late on Saturday night. It's hot and humid, the mozzies are biting like pint-sized vampires and I'm having the time of my life hunting ghosts with a group of paranormal investigators from Queensland. The cemetery was the first stop for the Queensland Paranormal Research and Analysis Group, who were in town on the weekend to conduct a paranormal investigation of the Grafton Regional Gallery's Prentice House in Fitzroy Street, which apparently has quite a history of ghostly occurrences. I was invited to tag along for the night. However, with on-site restaurant, Georgie's at the Gallery, also being a popular spot for the living on a Saturday night, the team had to wait until midnight to begin, so the group made up of five researchers started-off with a smaller investigation of the Grafton cemetery. 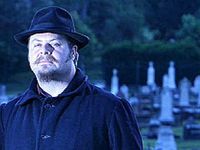 When I joined the team there, Chris, the self-confessed “mother” of the team, was staring piercingly into the inky blackness of the cemetery from near the road. “Tonight is going to be a good night,” she said. After that line, I knew I was in for something special. The team split into two groups. I went with Chris and her teenage daughter Courtney, who was being shown the ropes of paranormal research along with fellow outside-observer, Rose Marin, the education and public programs officer for the Grafton Regional Gallery, who like me was also along for the ride. Armed with equipment like digital voice recorders, electromagnetic field meters, digital cameras and temperature sensors, we set off, weaving a path through the looming headstones and into the hot, humid darkness. At one point during the walk, we heard what sounded like footsteps crunching in the gravel around the graves very close to us. With the other team on the opposite side of the cemetery, we looked for the source of the phantom foot steps, but found no one. Eventually we were driven out of the cemetery, not by ghosts, but by the thousands of mozzies busy feasting on us. The mozzies were also having a practical impact on the research with sound recordings the team were trying to make overwhelmed by the whining of the mozzies, making the prospect of recording electronic voice phenomenon (EVP) just about impossible. Before leaving, the team agreed the cemetery was either dormant of paranormal activity or it wasn't an “active” night. By the time we'd gathered back at the now-deserted gallery, I'd become fascinated with the team. I was struck with how “normal” they all seemed, especially given how mainstream society seems more comfortable branding people interested in things like the paranormal as “weird” or “out-there”. The team's members had regular lives with regular jobs, for example, Rob, the group's “half-sceptic” tech expert, is a fire safety door inspector by day. Chris, a former Graftonian, carried on playful banter between herself and her daughter while Liv and Aaron, two 20-something-year-olds, brought to the group youthful enthusiasm and a natural curiosity. However, they were all united in one thing – their shared interest in a field which, although is gradually becoming more socially accepted, is still shunned or laughed at by many in the community. However, whether you believe in the paranormal or not, there was no denying these people were passionate about what they were doing. Their love for this activity was obvious in the way they discussed previous investigations and the excited glint they had in their eyes as they prepared their equipment for Saturday night's hunt. So with a casual ease, the team prepared themselves in the gallery courtyard, having a playful chuckle or two at the same time. The playful mood soon came to an abrupt end. “Guys, the K-2 is going crazy. There's something here,” Rob suddenly said before we'd even ventured inside the gallery. 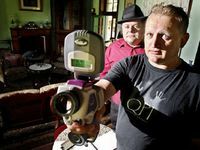 The K-2 meter in question measures electromagnetic fields and sudden spikes (when not in close proximity to electrical equipment or mobile phones) and is thought to indicate the close presence of a paranormal entity or ghost. While most people might get freaked out by the prospect of a ghost standing right beside them, Cheshire-cat grins immediately broke out on the faces of the team members. They knew they were on to something good here. Before the team headed into the gallery en masse, we were each told to step into the dark, silent, original section of Prentice House alone for a few minutes and get a “feel for what was around”. One by one the team went in and one by one they came out, all with the same feeling; that something was watching them from the top of the gallery's internal staircase. The general consensus was “we're not welcome here”. I'm not sure where I stand on the existence of ghosts, but when it was my turn to step into the building alone, I could see what the team meant. There was no doubt there was a strange feeling in there and there was indeed a strong sense of being watched from the staircase. As I was walking around inside I kept finding myself whipping my head back around to the stairs, expecting to see someone standing up there watching me disapprovingly. After this shared experience and given several ghost stories about the gallery involved the staircase in some way, the team agreed it would be a main focus of the night's investigation. Before further ado, the team threw themselves into their work with Rose and myself in tow. At one point I was with Liv in Prentice East, which most people know as the current indoor dining area. Suddenly her EMF meter went haywire in a particular spot with spikes much higher than even electronic equipment could cause, but then stopped just as suddenly. I saw this happen to her several more times. It was as if something was following her around in there and it soon became a matter of particular interest to the rest of the team. Later, Chris and Aaron remained in the building to do an EVP recording at the foot of the staircase while the rest of us went outside to avoid contaminating the results. During the recording session, the pair heard what sounded like footsteps on the stairs, light switches being flicked on and off in the upstairs rooms and what Chris described as “someone pottering about up there” – no one was up there at the time. 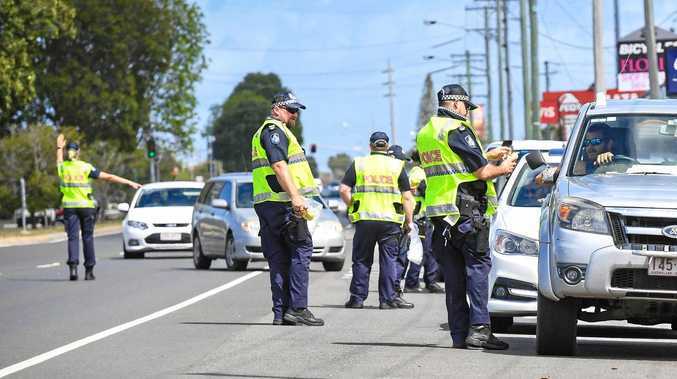 The investigation culminated with the team breaking into groups and sitting in different areas of the building – first in silence and then while questions were directed to the “presence”, to see if their equipment picked anything up. During the silent session, I heard (and recorded on my own voice recorder) what sounded like a baby's cry coming from somewhere in the building. Others heard this too, but some thought it was a lamb bleating or a gate squeaking. Rob and Chris then took turns asking questions, telling the presence to make a sound and even trying to challenge or insult it in a bid to encourage activity. During this part of the session, several thumps, bangs and rustling noises were heard and recorded. Rob said he felt a touch on the back of his head and both Rose and Aaron, who were posted at the top of the stairs, reported experiencing a numb feeling spreading from their heads downwards. After this final session, we met outside to compare notes. It was then discovered two video cameras set up for the last session had turned themselves off after about five minutes. Chris actually found the switch to her camcorder in the off position, something which physically requires a button to be pushed in and turned, however, nobody was anywhere near the camera when this happened. By this time it was about 3.30am. The team agreed they had all they needed and so we then left the gallery to whatever may reside there after dark. Some in the team felt it was a female presence, some thought it was a male, others disagreed it was a ghost at all and thought it was instead what's called a “residual haunting”, which is effectively sounds, feelings and energy “recorded onto” a place over the years and then being played back like a tape recorder. From my perspective, there was definitely “something” going on that night in the gallery. Whether it was a ghost or not will probably never be proved. Ghost or no ghost, it was an absolute delight sharing the experience with the QPRAG team. Their passion and enthusiasm for what they do was infectious and I believe if anyone is capable of bringing more social acceptance to this area of interest, which many still deem unacceptable, it would be people like this. I wish them all the best with their future investigations. The team is now in the process of going back through hours of video and audio recording from the night. Keep an eye on The Daily Examiner next week for a report on what they found. This poll ended on 22 March 2016. Yes - the truth is definitely out there. No - don't be silly. There's no such thing.